Writing on behalf of the National Council for Women for in the Sydney Morning Herald’s Women’s Column of 15 June 1921 Maybanke Anderson set out a proposal for the development Child Study circles for women. ‘Increasing understanding of psychoanalysis, and all that it involves, may, if women choose to study it and compare notes have an inestimable effect on future generations’. Hopefully ‘if every mother knows how to make a wayward child into a wise citizen our gaols and asylums might, in one generation, be converted into playgrounds’. She invited interested women to the first meeting at 3 o’clock the following Friday. It was probably inevitable that Maybanke, born in 1845, whose activism on behalf of women and children since the early 1890s, would make this link between psychoanalysis and child study. Interest in psychoanalysis was remarkably widespread across Australia during these immediate years after the end of the Great War. 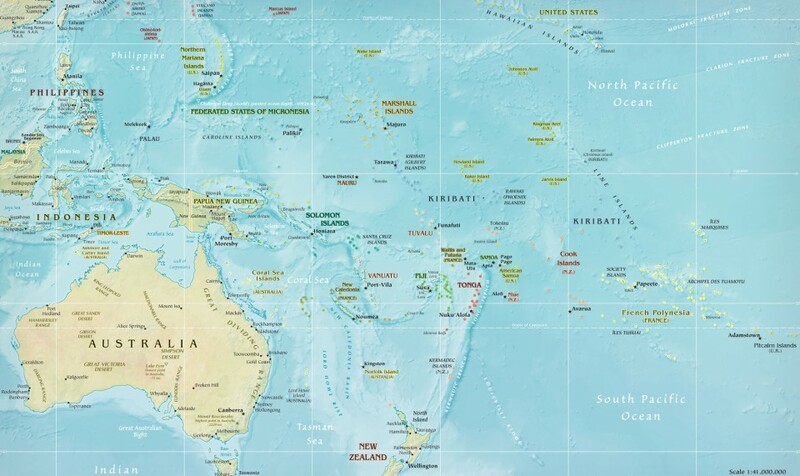 Perusal of the National Library’s Digital Newspaper collection shows that lectures and literature about psychoanalysis drew much interest – not just in the capital cities but in centres as far afield as Northern Queensland, and the far west of New South Wales. There was, of course, the realisation that shell-shock could be treated using psychoanalytic techniques, practiced by members of the medical fraternity. During the 1890s Maybanke Anderson had been a suffragette and,in 1894 founded her own paper, Woman’s Voice to promote reforming ideas about the rights of women and children. Her friends and associates of that time included a number of significant women reformers – Rose Scott, Lady Mary Windeyer and her daughter, Margaret, Louisa Lawson, and Dora Montefiore. 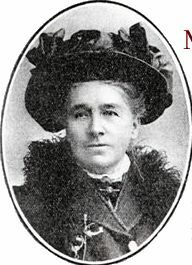 In 1896 when she was a campaigner for womens’ rights she and her colleagues had begun the world’s first free kindergarten in the Sydney suburb of Woolloomooloo, She continued working with the Free Kindergarten Union well into the second decade of the twentieth century.Her marriage to Francis Anderson, Professor of Psychology and Philosophy at the University of Sydney in 1899 also brought her into contact with the university world. Francis Anderson’s associate, the psychologist H Tasman Lovell was a particular admirer and friend. He had been charged with developing the first experimental psychology course, including the study of psychoanalysis at the University. Maybanke’s experience with children included teacher training and a period running her own school, Maybanke College in the early to mid 1880s. She was mother to seven children from her first marriage to Edmund Wolstenholme in 1876. Only two survived to adulthood. It seems that the take-up of psychoanalytic – and psychological – ideas by women and women’s groups in Australia at this time has not been documented. I cannot find much on this, even though the most recent published history of psychoanalysis in Australia, Joy Damousi’s 2005 Freud in the Antipodes has pointed to the work of the professors at various Australian Universities, and to the significance of the medical fraternity in the development of this arena. Yet women, such as Maybanke, were beginning to argue that as mothers and as educators the understanding of the inner world of the child was as important as physical care. Maybanke’s book, Mother-Lore, published in 1919, written in the form of an advice manual, picked up notions from the ‘New Psychology’ and from the Child Study Associations active in Sydney at the time. In her book she was concerned not with the physical, bodily care of children – there were plenty of such tomes, but with the parents’ responsibility to care for the developing minds of their children. She wrote in common language, eschewing technical, psychological terms. Her message was for mothers – and fathers. Maybanke’s argument was that the child’s mind is something that is to be understood nurtured and developed. Children were not miniature adults, nor primitives to be trained in the ways of civilisation but sentient beings learning about themselves in the world. Far from utilising stringent measures as those promulgated by New Zealander Dr Truby King, (was she having a swipe at him when she remarked that few doctors were concerned about the developing mind of the baby?) famed for his advocacy of the strictly timed, four hourly feed, Maybanke Anderson underlined the significance of the maternal/ parental relationship for the growing child. Her account of infant and child development is based upon careful observation and experience. Maybanke directs her reader’s attention to the developing baby – born blind and deaf, she asserts in the early chapters. She alerts readers to the babe’s exploration of self – of arms, legs, hands, toes and fingers but also notes the child’s developing emotional life. She notes that patterns established in early childhood continue for life, fears, lies, instincts and education. For twentyfirst century readers it is a glimpse into the common problems of child-rearing and notions of citizenship in middle-class English- Australian life during the early 1920s. A baby has a brain, of course, she wrote. It is the mother’s task and responsibility to direct and help the child to develop. Overall Maybanke seems to be groping, if not reaching for the notion that the mother’s/parents capacity for attunement and recognition of the babe’s gesture is central to the child’s sense of becoming. Her writing is powerfully clear. Note how the energetic child may become a lazy man. His small endeavours to construct were burned as rubbish, or swept away because they littered the floor. He hurt his fingers with the hammer and we denied him the result of his experiments and hid the tool he longed to use. He cut the furniture with his little saw and scratched the floor with his chisel so we took them both away, not remembering that training he got by his endeavours would be of more use than the polish of the furniture and the tidiness of the floor. He was a troublesome boy, always wanting to do something. So we sent him to school early; and there all the work was talking and reading, he learned that work with the hands was degrading rather than ennobling, and that, if he wanted to be a gentleman he must wear a stiff collar and a good coat. So at length with his bright enthusiasm killed, he learned to sit still and smother his instincts, and the world lost an inventor, and gained a draper’s assistant. If it were not so common we would think it a tragedy. ( Mother-Lore, pp 17-18). 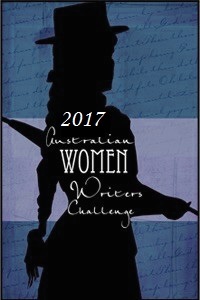 As a representative of the National Women’s Council Maybanke could have been following the lead of other women’s organisations in Sydney. It may be that some of its members also attended a lecture on psychoanalysis and war trauma given by Ethel Mortimer Langdon at the Women’s Club. In October 1920, the Feminist Club sponsored a lecture on psychoanalysis by Ruby Rich,who had just returned to Sydney after eight years away, some of these, a reporter from the Sydney Morning Herald, said, spent studying ‘under Freud in Switzerland’. Perhaps this was an error… Switzerland was the place where Carl Jung, Freud’s former protegé, was located. Rich’s lecture described as captivating by its listeners, was followed by a second lecture. Both were repeated. A month later Ruby Rich announced her intention to ‘form a study circle on the subject of psychoanalysis under the aegis of the Feminist Club’. Apparently the Club continued its interest in mental health matters. On 9 February 1921 the Sydney Morning Herald reported that the Feminist Club had passed a motion urging the re-centering of ‘the clinic of psychiatry’ in general hospital work, and not be carried out by the Lunacy Department’.The Club paid especial attention to children. It included a clause ‘that special provision should be made for children temporarily mentally affected under the aegis of the work of this (hospital) clinic’. Psychiatry was not Maybanke Anderson’s field. Her’s was education, in kindergartens and schools. It is clear though, that in the immediate post-war years that she and her colleagues were working together, albeit following different threads of thought – to advocate for the development of psychological services within their particular communities of parents and children. For them psychoanalysis – and psychology – held ideas that should not remain exclusive, confined within the portals of the medical fraternity. They had a place in the broader community to be used for its development. THE PSYCHOGALVANOMETER – Can Emotions be Measured? In my wanderings around the archives I have discovered a machine that purpots to measure emotions. It is called a Psychogalvanometer. When I learned that this critical piece of equipment was an essential feature of Western Australia’s Psychological Clinic, kept in the cupboard in the clinic’s Analysis Room, the psychogalvanometer became worthy of a post in itself. The Mirror (Perth, Western Australia) Saturday 22 November 1930, p.1. It had its uses. In his lecture to the Sydney branch of the Australasian Association of Psychology and Philosophy in October 1929, ( and reported in The Sydney Morning Herald 11 Oct 1929) psychiatrist and psychoanalyst, Roy Coupland Winn explained that the machine had ‘evolved’ in the Psychology Department at the University of Sydney. In experiments with patients with spinal chord injuries, Winn had found, he said, ‘that patients suffering from complete anaesthesia due to organic changes such as follow injury…to the spinal chord gave no psycho-galvanic response following pin-pricks in the anaesthetic area. On the other hand, in cases such as hysterical amnesia or of malingering, a response always followed stimulation of an area stated to be anaesthetic’. Anything that causes emotion will give the psycho-galvanic reflex’. The psychogalvanometer was a delicate and expensive piece of equipment. An article: ‘Some new apparatus for the psycho-galvanic reflex phenomenon’, composed conjointly by a team from the Department of Psychology at the University of Sydney and published by the Australasian Journal of Psychology and Philosophy in 1928 described its workings in detail. Too long to publish here, the article was written by electronics experts, outlining its construction, the flow of electricity as it reacted to the subjects skin secretions as they altered and varied in response to their state of arousal. The machine was expensive, in need of constant adjustment but through the work of the team at the Department of Psychology it was, potentially, a useful instrument for the assessment of the true emotional states of respondents. The machine linked mind and body and, it was supposed, enabled objectivity. It conceivably occupied the gap between the respective subjectivity of patient and doctor. This was what psychology was about, it seems, the gathering of evidence, and measurement.It aimed to exclude subjectivity. Group I: Table, light, house, cloud. Group II: Bible, holy, religion, to sin. Group I I I : Bird, dog, day. Group IV: Man, woman, love. Group V: Knife, clock, pencil. Group VI: Kiss, family, anxiety. be judged, very little emotional significance. In addition to the words, three stimuli were used which might be classed as nocive or threatening; these were: (a) a loud sound immediately behind the subject; (b) a pinprick in the back of subject’s neck; (c) the application of a small piece of moist sponge to the back of subject’s neck. galvanometric deflections and reaction times were recorded in each case. An attempt was made to discover whether the act of making a voluntary choice between two alternatives would cause significant galvanometric deflections. Cards were shown to the subject one at a time, first setting before him a definite situation in which he was to imagine himself, and then offering the choice of two alternatives, between which the subject was to choose. In the case of two of the choices the subject was asked to reverse his decision, and in all cases the time and deflections were recorded. 1. (a) The hour is late, and the day has been tiring; you are about to take the tram home, when suddenly you discover that you have lost your money. 1. (b) Would you choose to walk the distance home, or risk explaining your quandary to some decent looking stranger ? 2. (a) You are preparing to attend a social gathering at a home not previously visited. 2. (b) Would you prefer to go in evening dress, with a chance of being made conspicuous, or in ordinary dress, and perhaps feel out of place? 3. (a) You are convalescing; it is your first day out of doors, and the weather is bright but cool. 3. (b) Would you prefer to sit in the sun in an uncomfortable chair, or in the shade in a comfortable one ? 3. (c) Now endeavour to make a reversal of your choice, and arrive at a contrary decision. 4. (a) On returning home after making a purchase you discover that you have been given more goods than you paid for. 4. (b)They would never be missed, and their return involves the dismissal of the employee responsible. Would you return or retain them ? 5. (a) You have invited out to dine a new acquaintance, whom you wish to impress favourably. 5. (b) On finding you have forgotten your money, would you rather borrow from your companion, or risk the unpleasantness of an explanation to the management, to whom you are personally unknown? what emotions actually do cause such changes, but this fact is at present unknown’. we hold to the point of view that the psychogalvanic reflex does not register all emotions, for the “obstructed” situation of an attempted reversal of volition yields facial changes and bodily movements expressive of stirred-up mental conditions, far more pronounced than either free association responses or the act of volition itself. While of undoubted usefulness as one method of recording certain emotional change or changes, it does not appear that the psychogalvanic reflex may be regarded as a universal recorder of emotion. It ranks as a most important member among a number of methods of measuring somatic changes, but does not obviate other methods such as afforded by the pneumograph the cardiograph or manometer. It seems that the authors conceded that subjectivity was difficult to measure, if not impossible. By having the patient attached to the psychogalvanometer during the recital of his experiences, or during free-association, a continuous indicator of emotion is provided. Owing to the common tendency of neurotics to adopt the method of facile superficial associations as a defence mechanism, the psychogalvanometer also saves considerable time by providing evidence of unemotional associations, which can be interrupted with confidence. C.E.W. 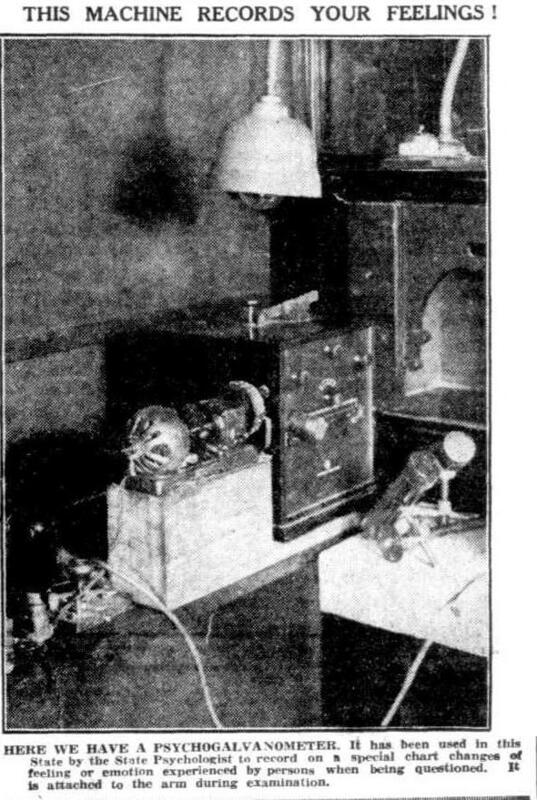 Bellingham, S. Langford Smith, & A.H. Martin, Some New Apparatus for the Psycho-galvanic Reflex Phenomenon, Australasian Journal of Psychology and Philosophy, Volume 6, Issue 2, 1928, pp.137-148. R. Coupland Winn, ‘The Psychogalvanometer in Practice’, Australasian Journal of Psychology and Philosophy, Volume 7, Issue 3, September 1929, pages 218-219.